For the first time research has quantified the financial gains that can be made through productivity if a company invests in schemes promoting wellbeing at work. Michael Millar looks at just how the discoveries were made. There is a clear relationship between health status and work performance, with 18% difference in work performance observed between individuals in the bottom quarter of health status as compared with those in the top quarter. Exposing a group of volunteers to a health programme led to a 29% reduction in the proportion of individuals with “high risk” health status and a concurrent 19% increase in “low risk” status. Intervention led to a significant improvement in self-rated work performance over the study period. 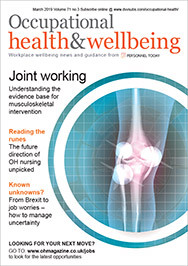 Analysis of results shows the intervention was the most highly significant and strongest predictor of both change in health status and change in work performance. Age and income had no appreciable bearing on the likelihood of change in these areas. Single men were the least likely group to change health-related behaviour over the 12-month study period. are the main areas driving change in health status and the consequent observed improvements in work performance. A conservative estimate of business benefits derived from the improvements in health status and work performance indicate a likely annual return on investment from such a programme to be £3.73 for every £1 spent. (iii) generate robust UK-centric health and performance management data to strengthen the argument for corporate health and well-being investment. The research was sponsored by an unrestricted grant from Standard Life Healthcare and Philips. The study had a prospective, controlled design and lasted 12 months. The intervention group were recruited from employees of consumer products manufacturer Unilever. The control group consisted of a sample of the general UK workforce who met the study inclusion criteria for age, employment sector and job type so as to be as similar as possible to the intervention group. These individuals were recruited by a research and marketing company. All participants completed three online questionnaires: an HRA (the vielife health and wellbeing (HWB) assessment), the SF-36 (a health-related quality of life questionnaire) and the WHO-HPQ (a work quality and performance instrument) at the beginning of the study and at the 12-month point. Baseline data collection occurred between November 2003 and February 2004 with 12-month data collection occurring between November 2004 and April 2005. The median time between questionnaire completion was 13 months. (iii) paper-based literature and information. The following table shows the demographic characteristics of the two groups. There were no statistically significant differences in baseline characteristics between the two groups. For each of these the differences in the variable between the two groups at the different time points were analysed (between group analysis). In addition, the changes in the variable over time for each group was also analysed. Additionally data SF-36 quality of life questionnaire was also collected and analysed. As we have observed previously, there was a clear association between health status (as measured by HWB score) and self-reported work performance. As well as the relationship between health status and work performance we observed a clear relationship between health status and short term absence. This table shows the baseline prevalence of the health risk factors that were assessed during the study for the whole population. These tables show the percentage of individuals in low- (0-2 risk factors), medium- (3-4 risk factors) and high-risk (5+ risk factors) categories at the start and also at the end of the study. This table shows the average self-reported work performance (0-10 scale) for both the control and intervention groups at both baseline and study end. There was no statistically significant difference between work performance scores at baseline between the control and intervention groups but at the 12-month stage significant improvements were noted. Analysis of within group differences show the decline in self-rated performance reported by the control group did not reach statistical significance, however the improvement seen within the intervention group was highly significant. Are the observed changes due to the intervention? Although statistically significant changes in health status and work performance were observed for individuals within the intervention group as compared with the control group it is feasible that these changes were at least in part mediated by another variable. In order to investigate this further general analysis has been performed. The principle behind the analysis is, in a single model, to determine which factors contribute to the observed changes in the study. The screenshot from the statistical programme (below) shows a strong and highly significant effect of being in the intervention group on the likelihood of changing health status (change in HRA score). The intervention is the predominant factor in effecting health behaviour change. An interesting additional observation is that there is an interaction between gender and marital status that has an impact on the likelihood of changing health status. Males who are single are very unlikely to improve their health status, and are, in fact, more likely to have a deterioration in health status independent of whether they are in the intervention or control groups. Which areas of health and wellbeing are contributing to the improvements in overall health status? Now that we have established that the observed changes in health status and work performance are due to the study intervention it is interesting to which modifiable health risk factors are driving this change. As well as completing the HRA and the WHO-HPQ questionnaires, all participants also completed the SF-36 questionnaire detailing their health-related quality of life. (i) Physical functioning – a series of 10 questions concerned with limitations in activities ranging from daily tasks to more vigorous activity. (ii) Bodily pain – questions quantifying pain over previous four weeks and the impact it has had with everyday activities. What does this mean in terms of business benefit? Utilising the work performance data it is possible to quantify the impact of the intervention on productive work time in the intervention group. At the start of the study period the average performance rating for individuals in the intervention group was 7.54/10, in other words for 24.6% of the time individuals were not working completely effectively. If during this time individuals are working at 50% capacity then 12.3% of weekly work time is completely ineffective. At the end of the study the average performance rating was 8.18/10, ie 18.2% of the time individuals were not working completely effectively. By the same token, if they were working at 50% capacity at this time then 9.1% of work time is completely ineffective. The difference between 12.3% and 9.1% is 3.2%. 3.2% of the working week is equivalent to 1.28 hours per week or 5.12 hours over the preceding four weeks. Assuming that this gain has occurred in a linear fashion over the preceding year, therefore the true average monthly gain is 2.56 hours per month. Over the 12-month period this is equivalent to 30.72 hours per individual. In financial terms this is equivalent to £560 per employee per year. Programme implementation and delivery costs were £75 per head, yielding a return on investment of 3.73 to 1.